I thought things were getting intense when I brought the chilli plants and tomatoes into the bedroom to ripen but when bugs got there too I knew something serious was going on! 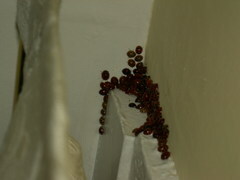 These ladybirds (US ladybugs) might be Harlequin ladybirds, a recent introduction here and one which is spreading fast. I didn't see many in the garden this year (and I didn't see much aphid activity either - connected?) and I'm wondering why they are colonising indoors? Blight is the bane of potato growers (and tomato growers) but The British Potato Council's Fight Against Blight and Blight Watch are two websites, aimed at commercial growers, that report outbreaks and near misses by post code, alerting growers by email or phone text message. Volunteer local 'blight scouts' monitor humidity and temperature data passing on warnings of conditions that favour the spread of blight spores. OK. So you've got to register as a grower (though there is a category 'other' on the drop down list)but the site does have a useful factsheet (click here) for gardeners from Garden Organic on how to deal with blight. Does anyone know what the heck is happening to my corn? 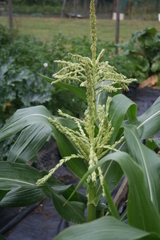 It's shooting upwards producing what looks like seed and nary a cob or tassle in sight. Not good things I think. I can't imagine I'm going to get any tasty cobs from this lot. And I did nothing different this year than last - same F1 seed, Swift, planted out in blocks not rows. What went wrong? Poor pollination? Lack of water? Have they bolted? At this time of plenty it's almost too much to admit to another failure. But like the good folks on Allotment No 21 I'm willing to 'fess up to another case of blosom end rot. Anyone else got a disaster on their plot?